to hundreds of guests in Johannesburg. hanging out with Zakumi at the launch. Enjoying themselves at the launch. Zakumi showing off his soccer skills. “He’s young, vibrant, energetic, enthusiastic, sociable, self-confident and ambitious.” That’s how Danny Jordaan, head of the 2010 Fifa World Cup Local Organising Committee, described Zakumi, the football tournament’s mascot. Introduced to the world at a lavish event at the South African Broadcasting Corporation headquarters in Johannesburg yesterday, Zakumi is a fluffy young leopard with green dreadlocks and a wide smile. Until the launch his identity was a closely guarded secret, to build up the hype and excitement around the tournament. 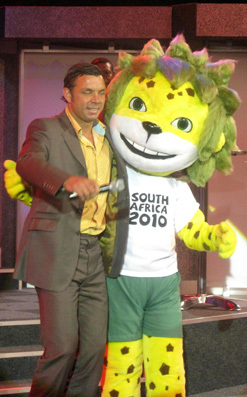 South African football star Mark Fish introduced the mascot in an exclusive media briefing, after which the two showed off their football skills in front of the crowd by kicking a ball around the stage. “Zakumi represents the people, geography and spirit of South Africa, personifying the essence the 2010 Fifa World Cup,” Fifa general-secretary Jerome Valcke said at the event. 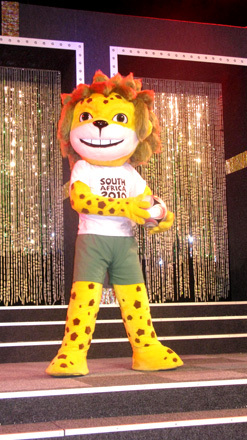 Zakumi was designed and his costume produced exclusively in South Africa. His name is a combination of “ZA”, South Africa’s domain name, and “Kumi”, which means “10” in a number of African languages. 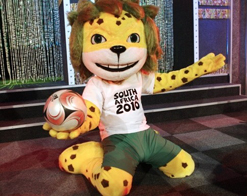 A number of South African companies were asked to design a mascot for the 2010 World Cup, one that would represent both South Africa and Africa as a whole. The mascot had to be easily identifiable and had to represent the World Cup in a way that would leave a lasting impression. After a long process of elimination, Fifa decided on a design by Cape Town designer Andries Odendaal. The costume itself was produced by Cora’s Costumes of Boksburg, east of Johannesburg. Owned by Cora Simpson, the company has 22 years of experience in costume making, and has made other high-profile costumes, such as the US cartoon figures Bugs Bunny and Tweety the bird. The man behind the actual creation of the figure is David Mbewe, who has worked with Cora’s Costumes for over 20 years. After meticulously choosing the right mix of fabrics and colours, Mbewe and his assistants assembled the costume, sewing the leopard spots by hand – no easy task, Simpson said. Fifa have given their mascot a distinct personality and personal history. Zakumi was born on 16 June 1994, a day and a year of great significance in South Africa. The 16th of June 1976 saw the beginning of the Soweto youth uprising, when schoolchildren took to the streets to protest against apartheid, many of them cut down by police gunfire. And 1994 was the year that South Africans of all races cast their votes for the first time to elect a new post-apartheid democratic government. They say he loves to perform and always follows his instinct and intuition, and has the tendency to exaggerate. But, say Fifa, there is one thing that’s undeniable about Zakumi: he loves football. He sees it as a great way connect with others and break down language barriers. As a sign of his undying passion for the game, he always carries his football around which he will use to invite people to play with him. “He wants to create a good mood for the fans and raise the excitement for the 2010 Fifa World Cup, the first on African soil,” said South African soccer legend Lucas Radebe. For 40 years each Fifa World Cup tournament has had its own unique mascot. The first was World Cup Willie, the mascot for the 1966 event, hosted by England. Meanwhile, Fifa is two award two free World Cup tickets to every construction worker involved in building the tournament stadiums, some of which are expected to be completed in time for the Confederations Cup in 2009. The ticket bounty was announced by Fifa president Sepp Blatter during a four-day visit to South Africa in mid-September. “I have good news for the workers,” Blatter said. “We have decided, with the Local Organising Committee, to offer about 20 000 workers two free tickets to the stadiums where they are working. Tickets for the confederations cup will go on sale on 23 November, a day after the draw for the competition. Tickets for the World Cup go on sale from January 2009. Do you have queries or comments about this article? Email Khanyi Magubane at khanyim@mediaclubsouthafrica.com. the official mascot for the 2010 Fifa World Cup.